Dr Farrell is absolutely correct in his assessment. But it should certainly come as no surprise to him or to anyone who has been observing how this Government operates that the AG and the PM were unable to resist the temptation to be self-serving. Congress of the People (COP) chairman Joseph Toney says an independent body should be set up on selection for the award of silk. THIS Government needs to explain to citizens the process by which persons were appointed as Senior Counsel or given the “silk” title says former attorney general Ramesh Lawrence Maharaj. ATTORNEY General Anand Ramlogan asked his Cabinet colleague, Minister of Justice Herbert Volney, to apply for the honour of “Silk”, but Volney refused to do so, Volney said yesterday. Until those two self serving rascals(I won’t call them maggots, they not there yet)return teir awards, the process would remain dishonored. Now the AG want to abolish the system, rather than admit he was wrong. How boldfaced can one man of very humble origins get? Way to go cuz Rammy , and to hell with dem disgruntled PNM backbenchers, old school UNC opportunistic bone heads, and clueless Trini media , and poll. If I were you too I would just hold on to my silk , as looking at de historical trends , one never knows ,if this opportunity will, ever present it im again. The last vestiges of neo colonialism , some say , must be maintained , at all cost. What do you know , dis guy Rammy , probably tried what , 12 cases ,in his entire life , and his boss did what, practiced Moot law ,at Hugh Wooding with pimple face 21 year olds, and she too keeping her silk? Got to give some Luv , as per usual to Uncle Basdeo, as it was him that reminded us, in eloquent fashion , that “Politics has a morality all of his own,”yes? His protege, Queen K , was certainly a fine student as can be attested by dis charade, but as for the COP Pit bull Rammy…, well we can put in the missing pieces, as to what we think of him , and his ‘Sansara bound,’ ,twisted soul? Long live the Republic of T&T. 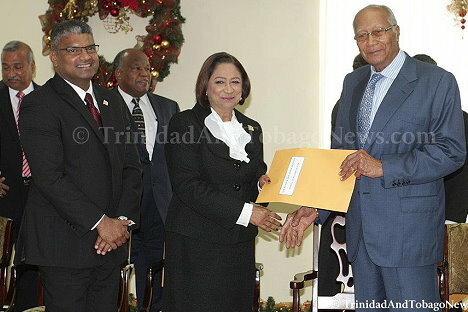 OPPOSITION LEADER Dr Keith Rowley yesterday told Prime Minister Kamla Persad-Bissessar to return the award of “Silk” she received from President George Maxwell Richards on December 29, 2011. Attorney General Anand Ramlogan says he will give consideration to abolishing the entire system of granting Senior Counsel status to nationals of T&T. THE PARENTS of Chief Justice Ivor Archie said yesterday their son was deserving of the title of Senior Counsel, even though he did not apply for it. Sorry Mamma , and Pappa Archie , but by accepting this silk , your politically naive son , unfortunately fell into a carefully laid ‘briar patch plot ,of dangerous , Cobra / Mappipi snake ,epic proportion- if you catch my drift. As a consequence of dis folly, he has again set back the integrity of yet another important state institution, thast is dependent on independence to function effectively . Hopefullly , he might some day eventually salvage his self dignity , after this most embarassing debacle. There are those much wiser than myself, that might be tempted to conclude that our Judiciary is compromised by non transparent , Trini politics as usual- as played out by immoral, self serving social bandits. This might indeed be hash conclusion , but who am I to question de logic of ,… well… folks that are wiser than myself , yes? Precidents dey say , and can you believe dat,it’s 2012, and political barbarians, are still looking over their shoulders like Lot’s wife, apparently forgeting as to the real reasons , they were granted an overwhelming mandate , by the electorate last election. I tell you folks,it’s getting tough to still be in luv with my country of birth. However , we wish our cross cultural hodgepodge collection of people well! In the years since our blessed nation has become a republic, it has become customary that attorneys from respectable and patriotic communities have deservedly awarded themselves silk upon attaining the distinguished position of Attorney General. This year, though, we have witnessed the unseemly sight of an upstart from the cane fields following suit, apparently believing that he is of the same ilk as his distinguished predecessors. By doing so, he has tragically tarnished this once-noble status of silk. Small wonder, then, that controversy has ensued. We ‘DE sophisticated globalist , pro humanist, info highway driving folks,’ across Trini Center,can distinguish between self serving ,egotistic, socially insecure, MORALLY DEPRAVED , ‘frauds/ fakes/ imposters,AND yes ,PHONIES,’as opposed to the real deal. Come again my friend. Your AG , de COP pitbull in Her Majesty Queen K’s regime-being over his head-has made about 1000 missteps, since assuming power, and has misled his boss, about 3000 more from a legal standpoint, and this is just one of many.Politically astute as we are , we know why he can get away repeatedly with murder . The way forward therefore, is contrition,and acceptance of mistakes. Translation ,is to place themselves at the mercy of the people , after returning this symbolic honor. If he ,de AG doubt’s that ,let him ask fake Christian, Opposition back bencher, FORMER PM, Patrick Manning, or instead , his OWN loyal , PROUD, Sky God ,WHITE Jesus, Christian, wife, as they can enlighten him. We wish our people well! However, I remain concerned that at least some of the venom spewed against the current AG looks like the typical visceral reaction against any East Indian in a prominent position— that he has got above his/her proper station in life through corrupt,racist or underhand means, that immediate condemnation is in order,and that clarification of the precise nature of the corruption can unfold after the condemnation.